Fancy a trip to the Brisish Isles? If you're the cautious type and like to know what you're getting into before you set out, look up Neil Macleod Prints (or ask your local shop to do it for you). Chances are they have a deck of cards just full of pictures of the very place you're interested. 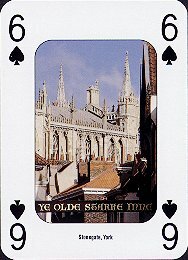 This deck is about the city of York, and the surrounding Yorkshire. 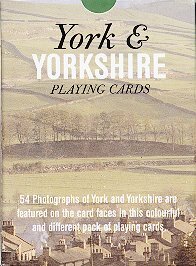 With photography by Colin Baxter, known for his book of photographs of Yorkshire, this deck conveys the beauty of Yorkshire well. Pictures from the panoramic and sweeping to the subtle and small help bring you into the hills of farmland, the ancient castles, the rivers and woods, and the alleys and byways of the city itself. Putting together a deck like this is harder than you might think - whittling down hundreds of pictures to just the fifty-four that you think will work best is no mean feat. Whittling those down to just the five here was a chore itself, too. 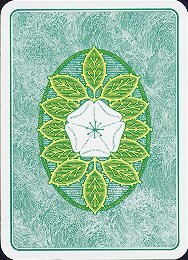 Each card has its own moment, its own spirit, and its own special beauty. 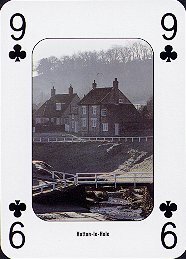 Old castles, partitioned fields, the ever-present sheep, and even the corner fish-and-chips shop find their way into this deck. 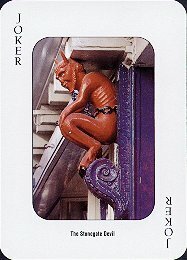 And leave us not forget the Stonegate Devil himself, pictured on the joker above. 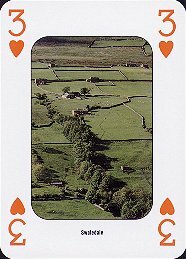 Even if you think you might never get to Yorkshire, get this deck. It just might change your mind. All images © Colin Baxter and Neil Macleod Prints, displayed here for commentary, analysis and appreciation only.